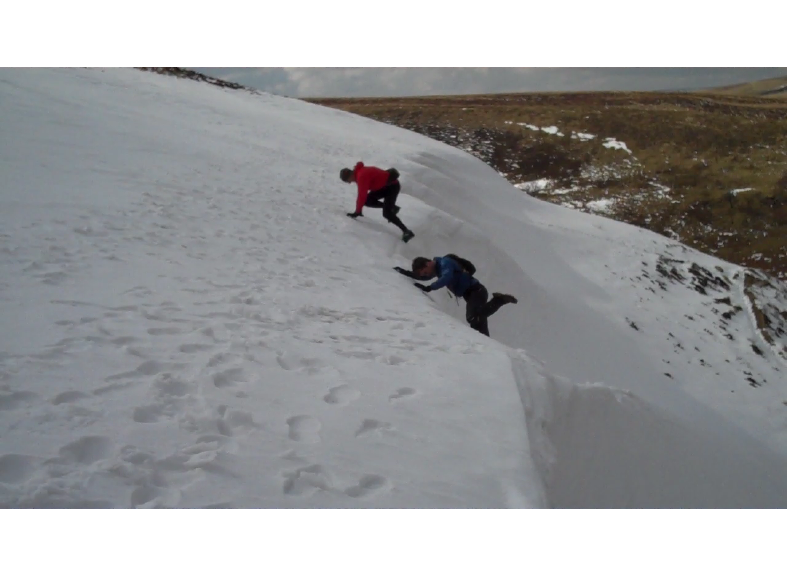 Fell Running in the Peak District has been difficult of late. But this weekend Spring showed her long awaited face and warmth returned. 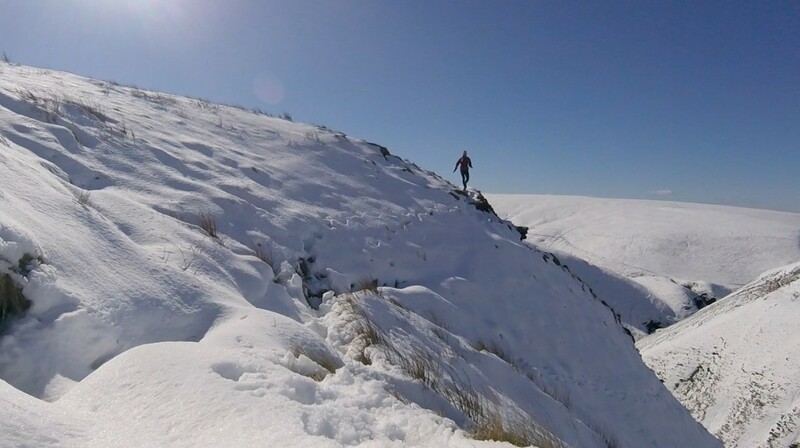 Blue skies, sunshine and a respite from the nagging, bone chilling easterly wind that we have endured for weeks made for perfect conditions to get out onto the hill. 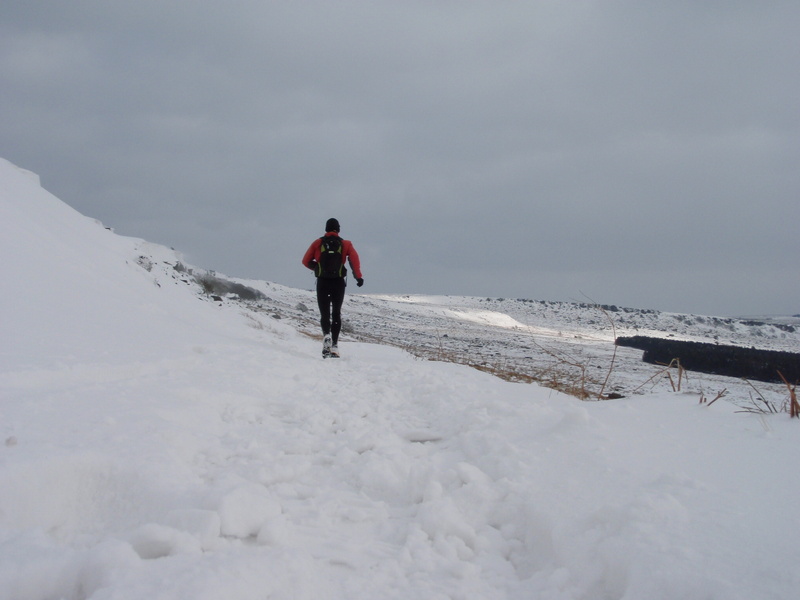 Snow still lay, deep in places too and consolidated into steep banks but this enhanced the conditions adding an element of interest to the run. 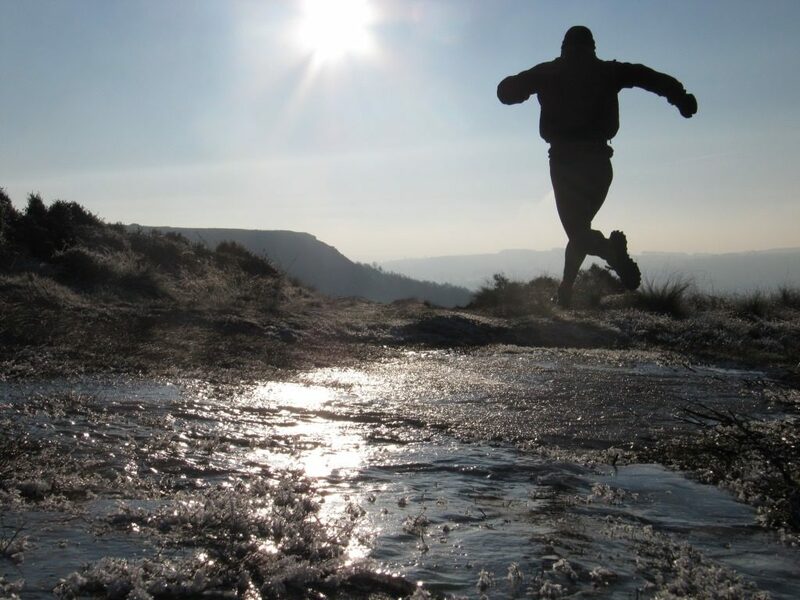 My route took me along Derwent Edge, picking up the route of the Ultra Tour of the Peak District to Lost Lad, then headed off to the beautiful Abbey Brook before climbing back up to rejoin the race route and follow it towards Derwent Moor. 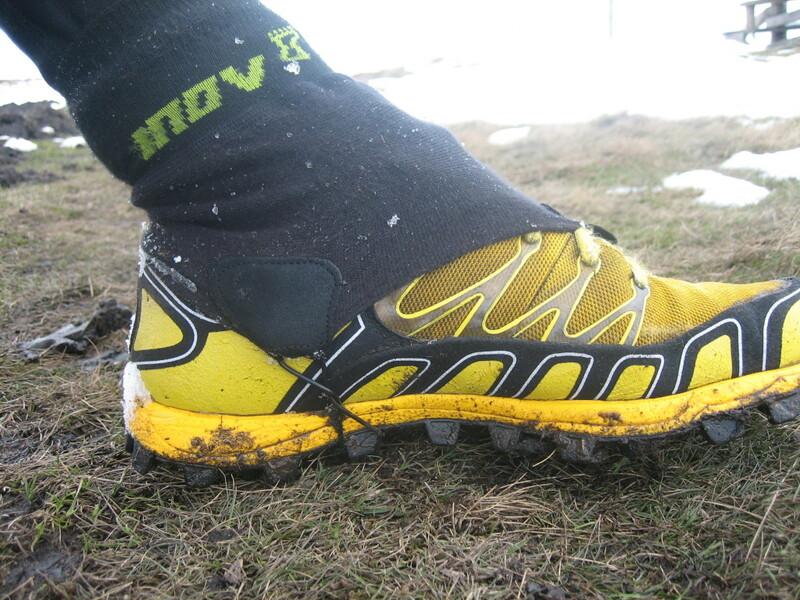 I recently won a pair of Inov-8 Debris Socks. 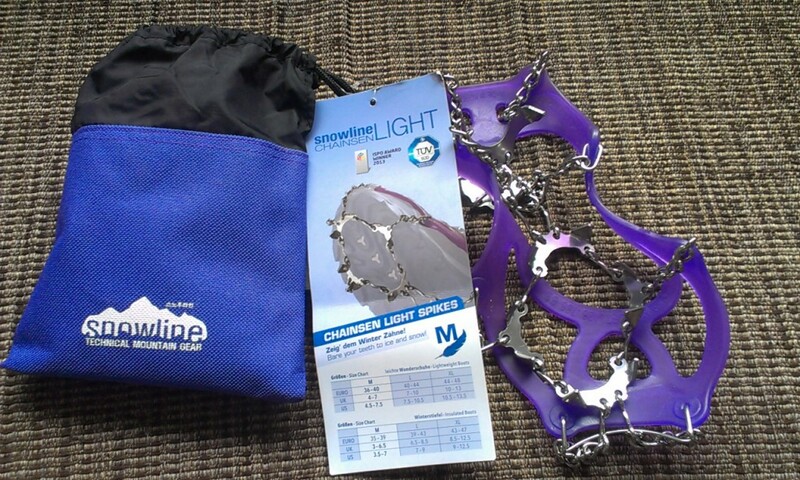 Designed to keep grit and stones from getting into your shoes I promptly put them to the back of the drawer thinking they’d come in handy next summer. 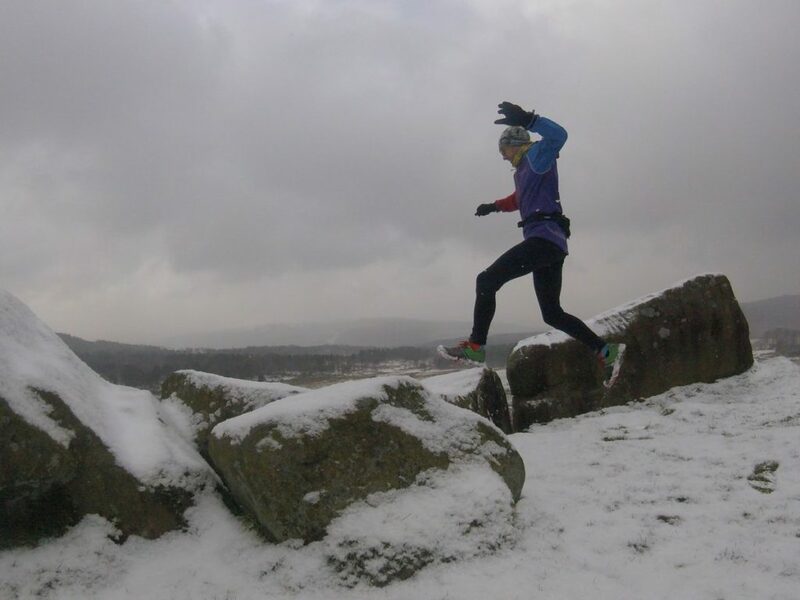 However during last month’s running when I yet again ended up with shoes full of snow I remembered that I had them and wondered if they’d work in snow. 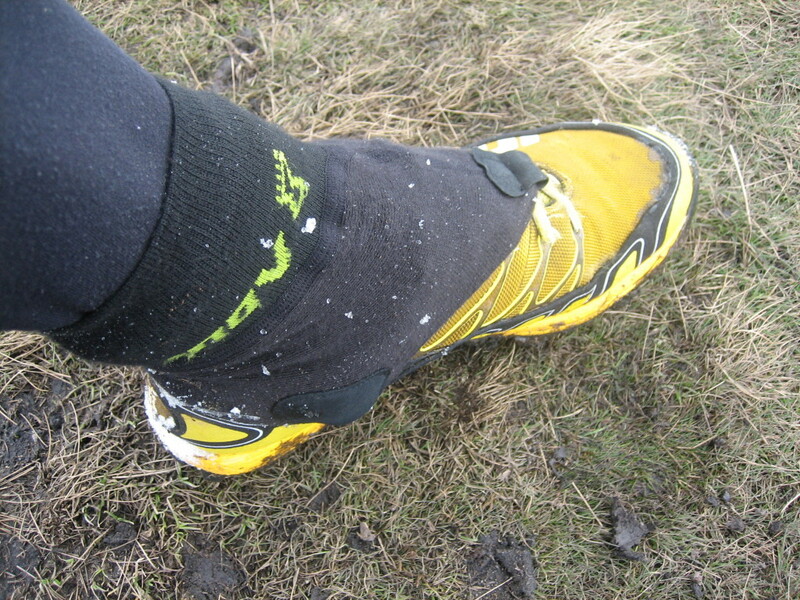 The socks are basically just that; nice, comfortable Coolmax sock but with an extra bit of sock that folds down over the laces of your shoes and hooks onto the lace with a metal hook – just as with normal gaiters. 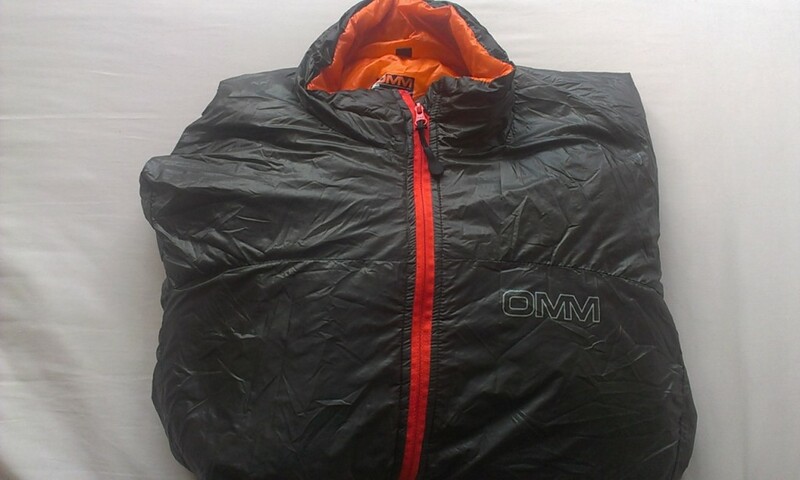 I wore them over a pair of thin wool socks and pulled them up over the bottom of my leggings – this was mainly so they could be seen on the photos, I would normally wear the leggings over the top. 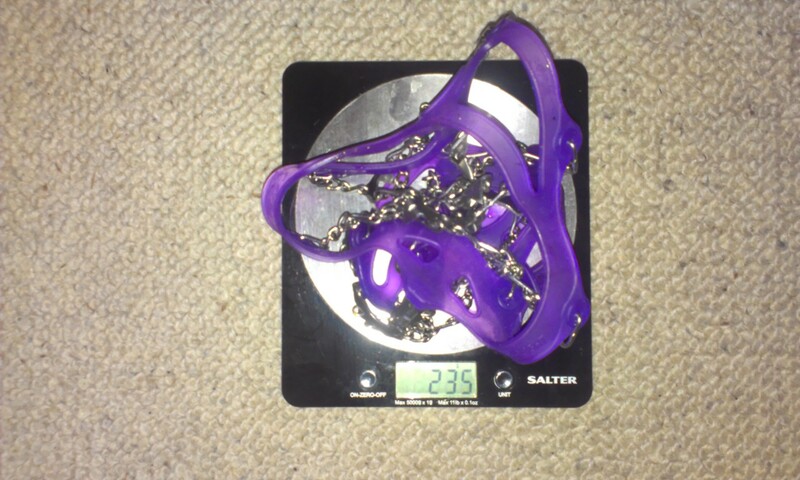 They have 2 thin plastic hoops that act as stirrups, going under the shoe to prevent the socks from riding up. 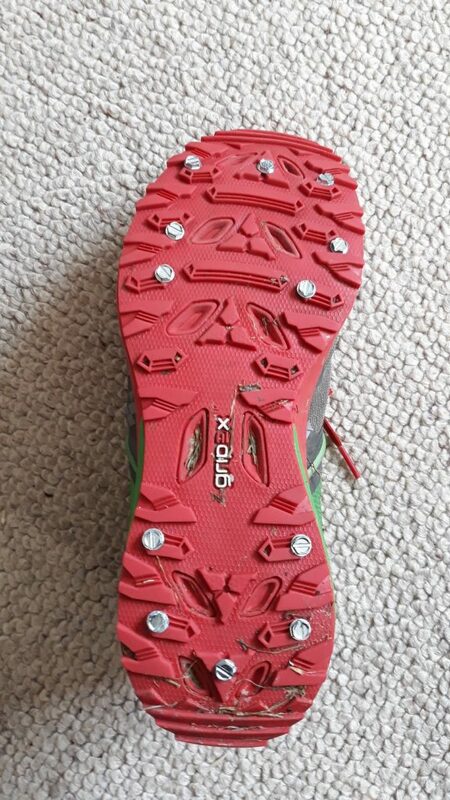 Using the socks with a pair of Inov-8 Mudclaws, the lugs gave a secure grip for the stirrups and I experimented with several different positions (under heel, under instep etc.) all of which seemed to work. 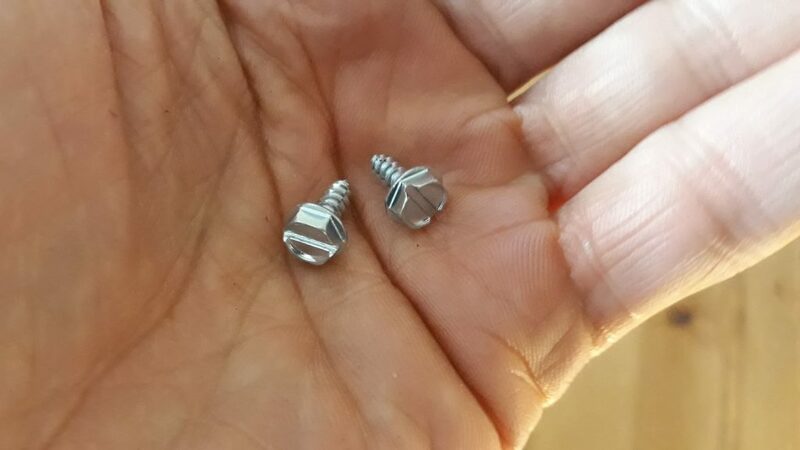 So, how did I get on? 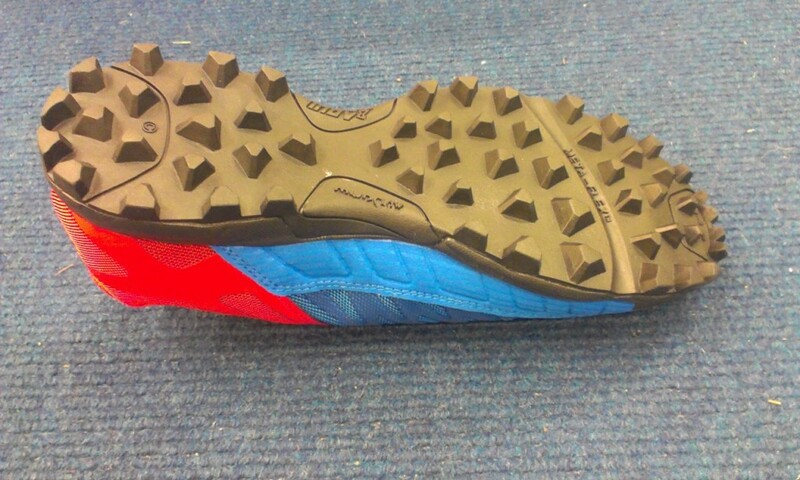 Well basically they did what I wanted them to do which was preventing snow getting into the gap between shoe and foot. 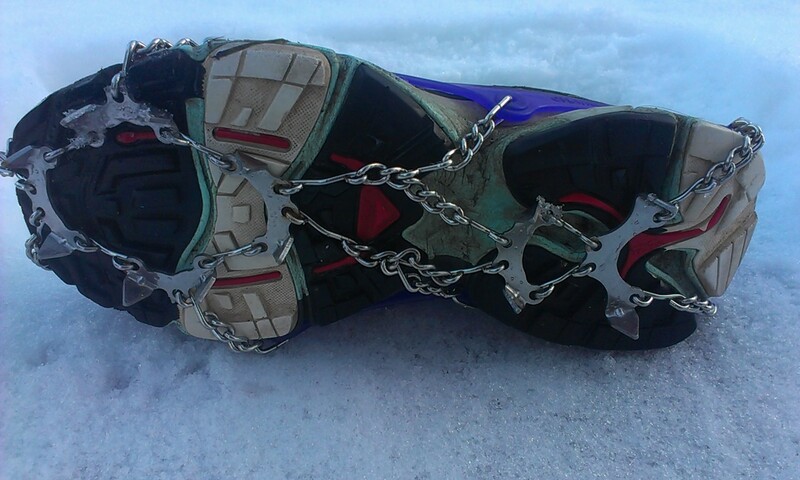 no snow in my shoes! 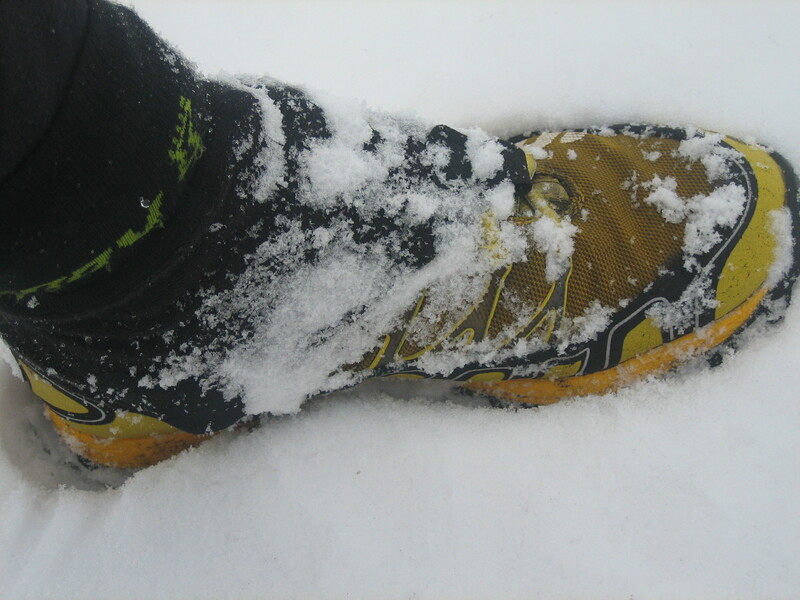 Running through deep snow lead to snow building up on the sock material but not getting behind the tongue or into the shoe itself. 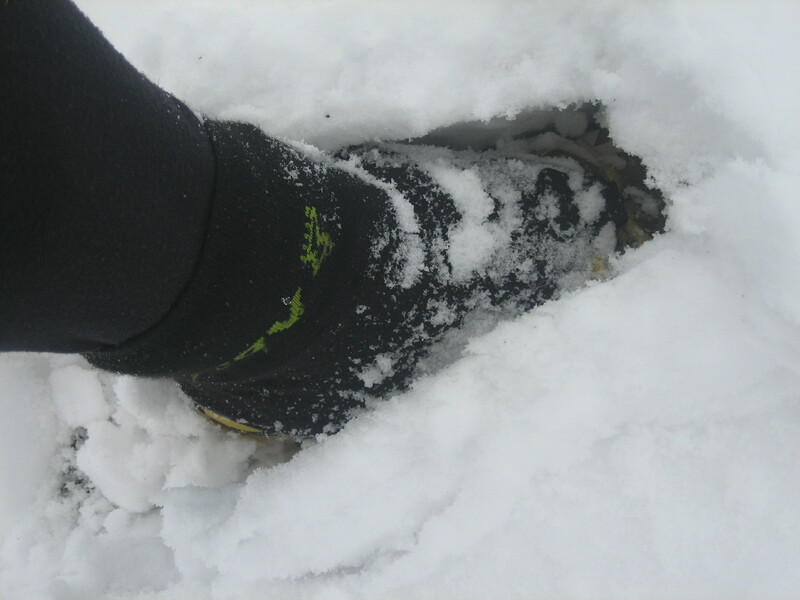 As with any wool mix sock they are not waterproof and my feet did eventually become damp, although not cold. 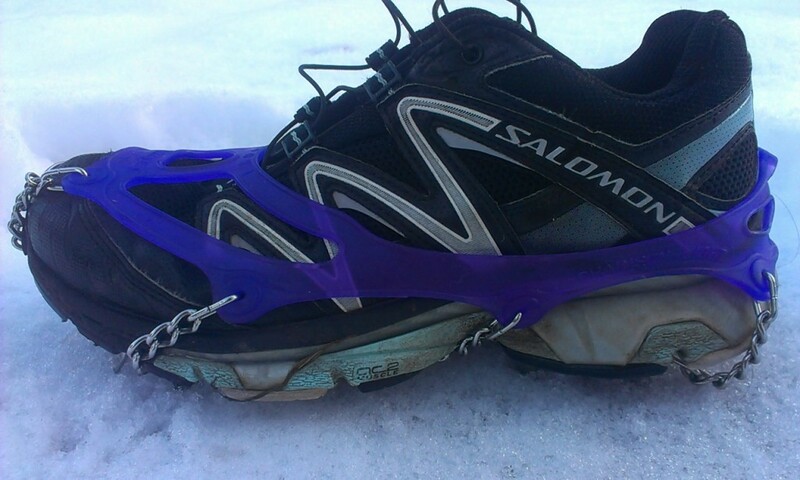 Another advantage was that they prevented the laces from freezing up which made untying them at the end of the run easier than normal. 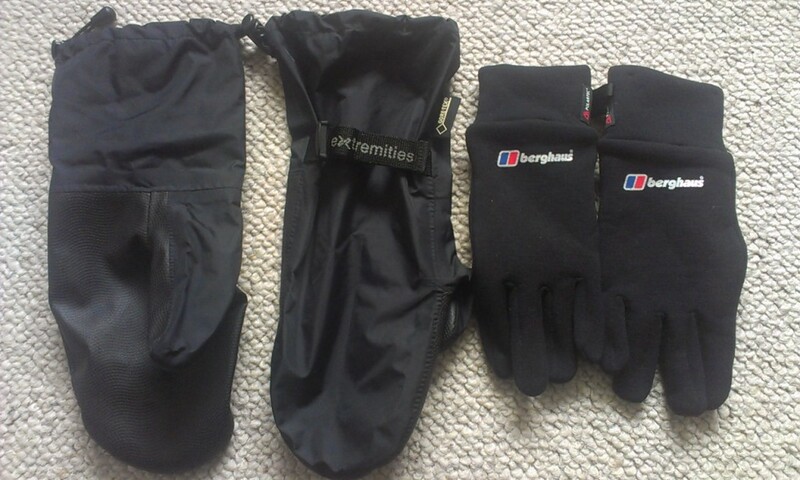 The one thing I did find was that they were fiddly to get off with cold hands after the run. My fingers were too cold to pull the stirrups off and I found that taking them off whilst they were still attached to the shoe was the best method. 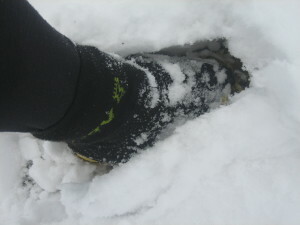 I have since used the Debris Socks on all runs where I have anticipated deep snow and I’m glad that I discovered them. 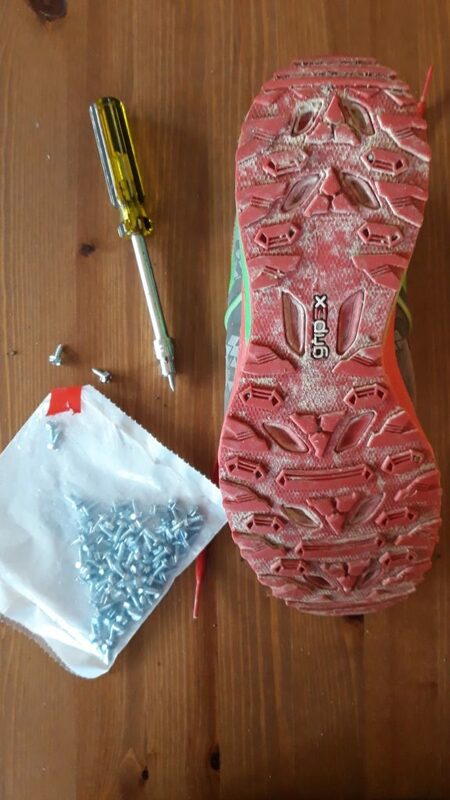 I’m now looking forward to using them on dry, dusty summer runs! 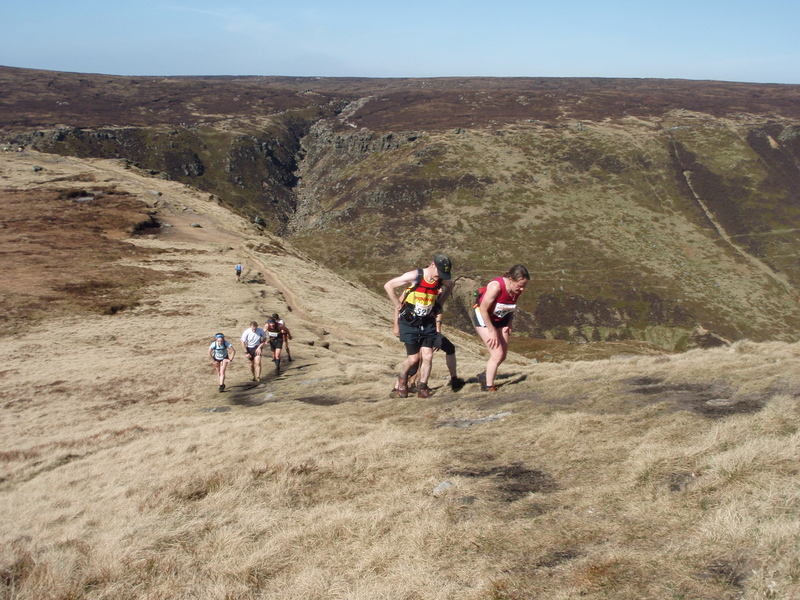 A year ago I sat in the sun on Grindslow Knoll, marshalling on the Edale Skyline fell race. 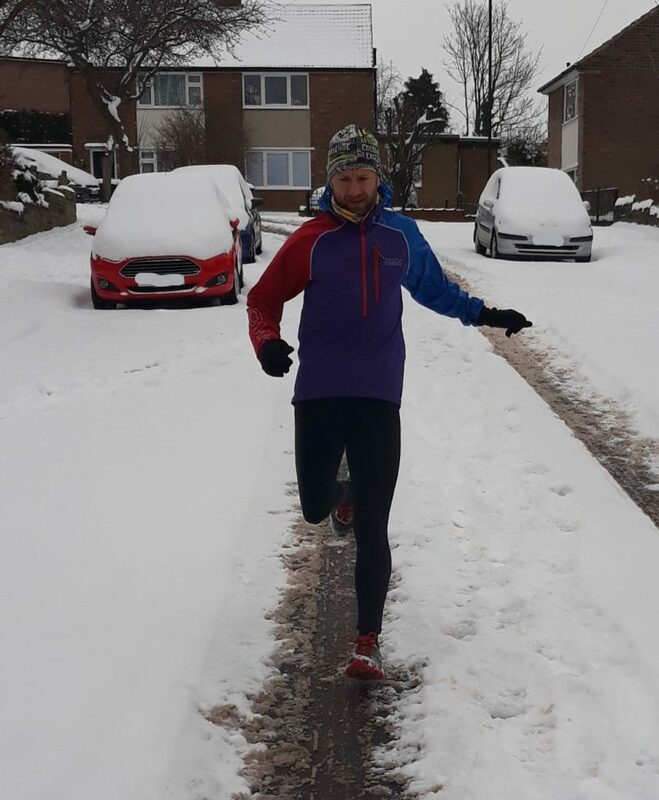 This year I had planned on doing the race and was looking forwards to a gruelling 20 odd miles of running, however Mother Nature had other ideas. 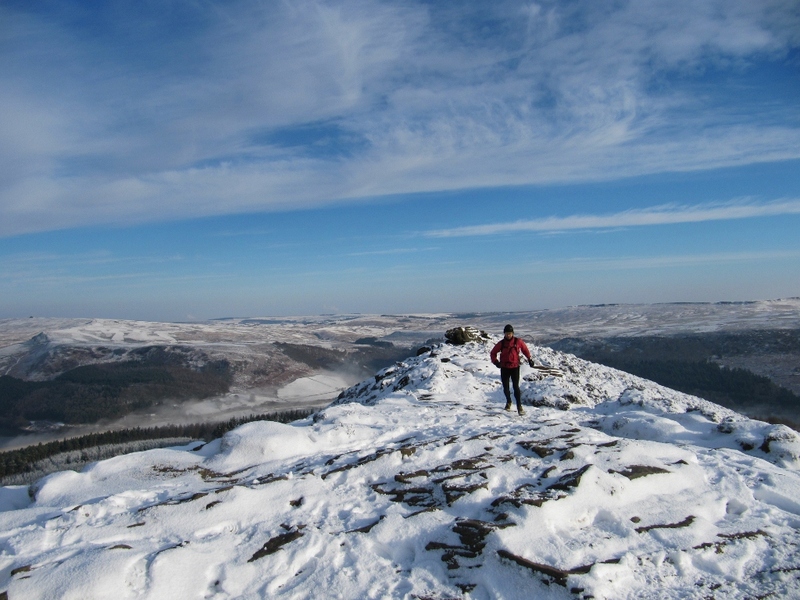 The stubborn area of high pressure to the north dragged bitter easterly winds from Siberia and where these met the warmer, moist Atlantic weather fronts it snowed..and didn’t stop. 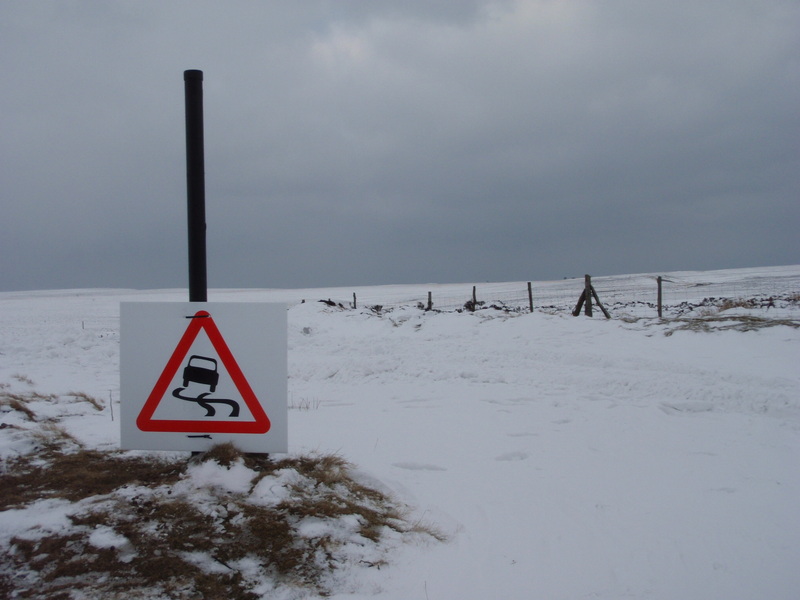 The race was inevitably cancelled; main roads were impassable let alone getting to remote hill tops. 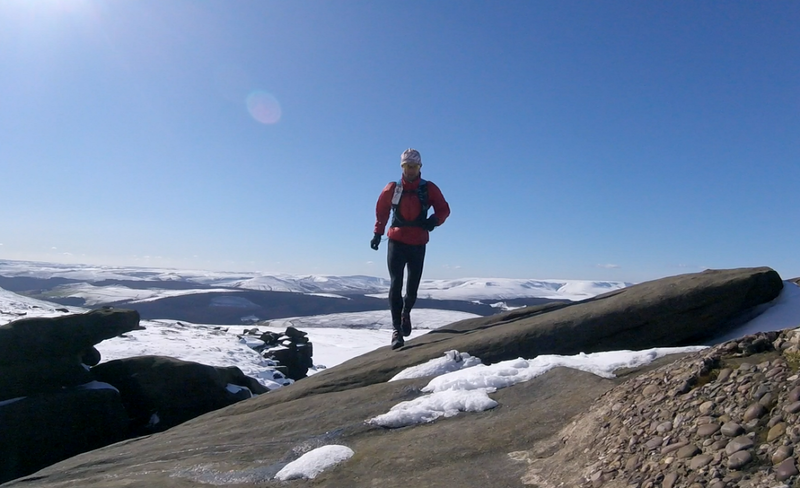 So a year on finds me running (or at least attempting to) on one of my favourite routes in the Peak District; the Burbage Valley. 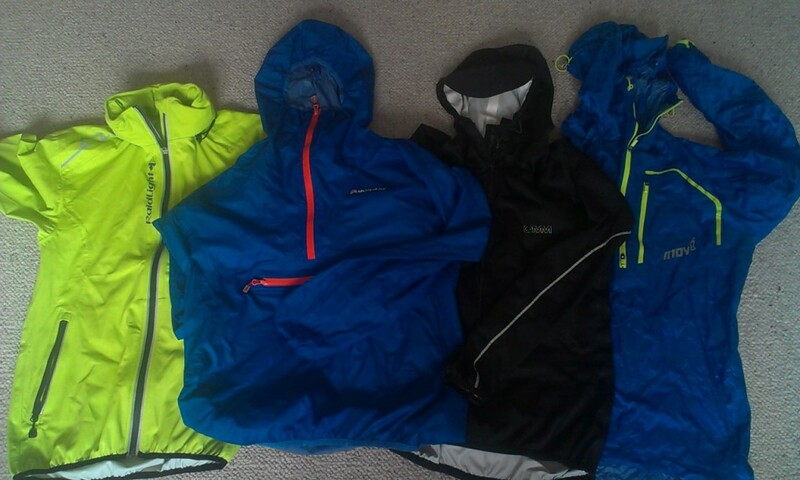 No vest and shorts this year, I’m in full winter kit vainly trying to cover all flesh, to avoid the icy daggers that the cruel wind picks up and flings against my skin. 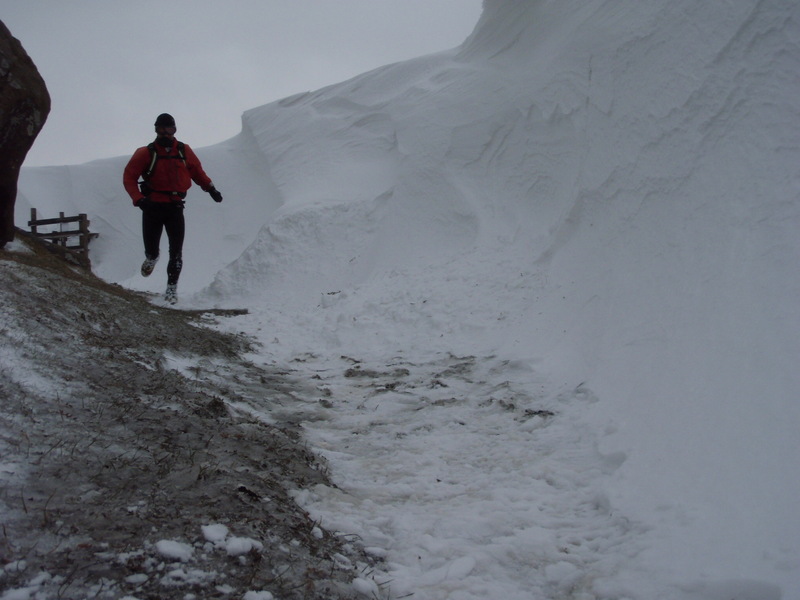 The going is tough, unpredictable, sometimes runnable as, scoured by the wind the ground it bare of snow yet in other places it is piled up and blown into deep drifts. 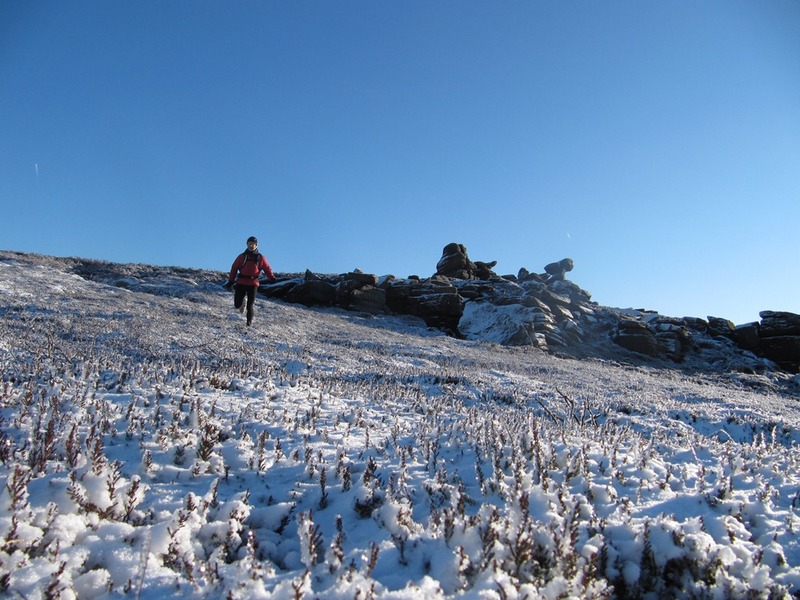 The run is a constant stop – start, just as I get into a rhythm I am abruptly halted as I flounder knee deep into a drift, then firmer ground – running again then flounder…and repeat. 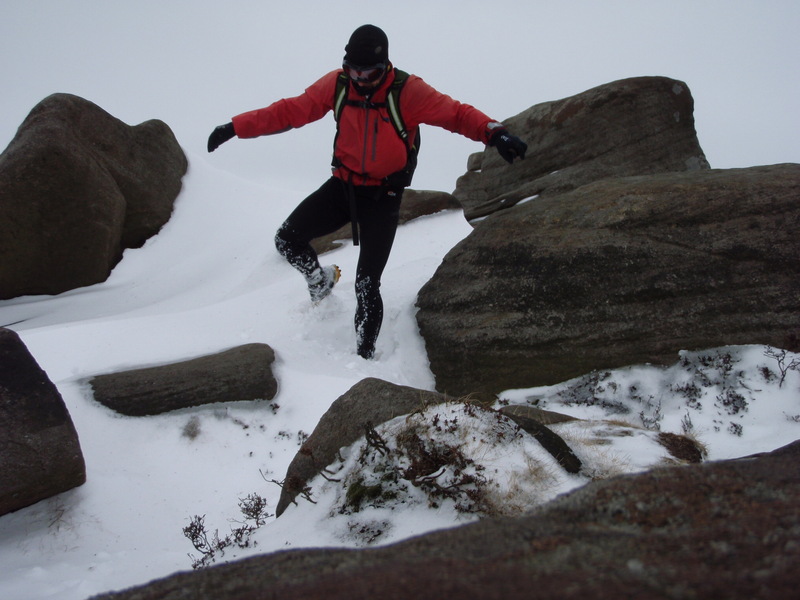 Over Higger Tor I drop down to the road to avoid the deepest of the snow, no traffic today. 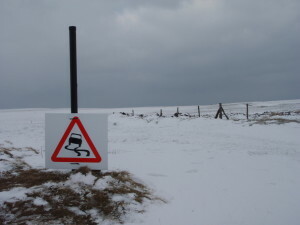 I am amused to see a temporary sign warning drivers of hazardous conditions. Past the twin bridges I take the main path heading down the valley and here gain some respite from the wind. 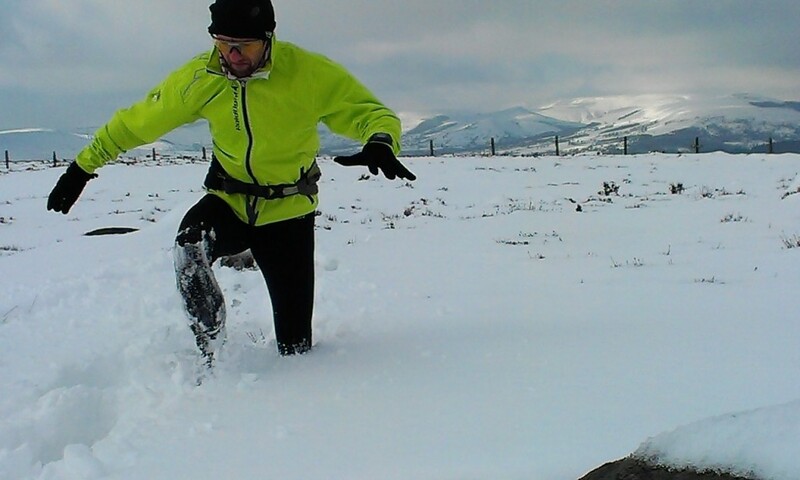 At last I can run relatively unimpeded as only a thin layer of snow covers the path. I cross the road and follow the brook for a while before cutting right, back towards the car park where I started. 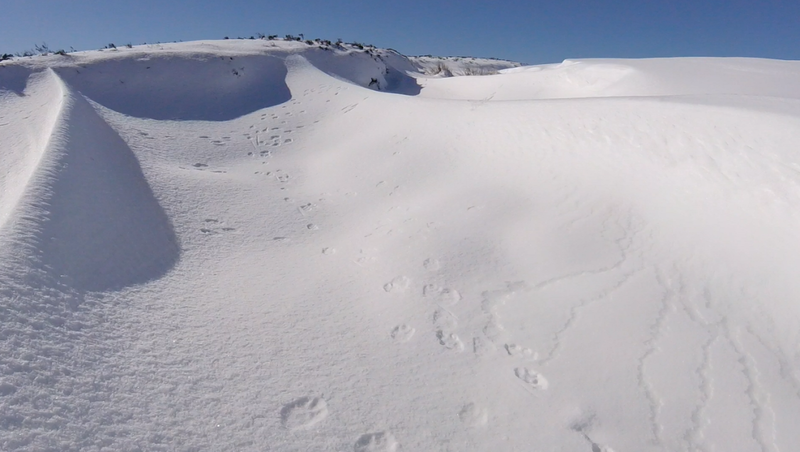 I follow a sheep path for a minute, the snow only ankle deep. 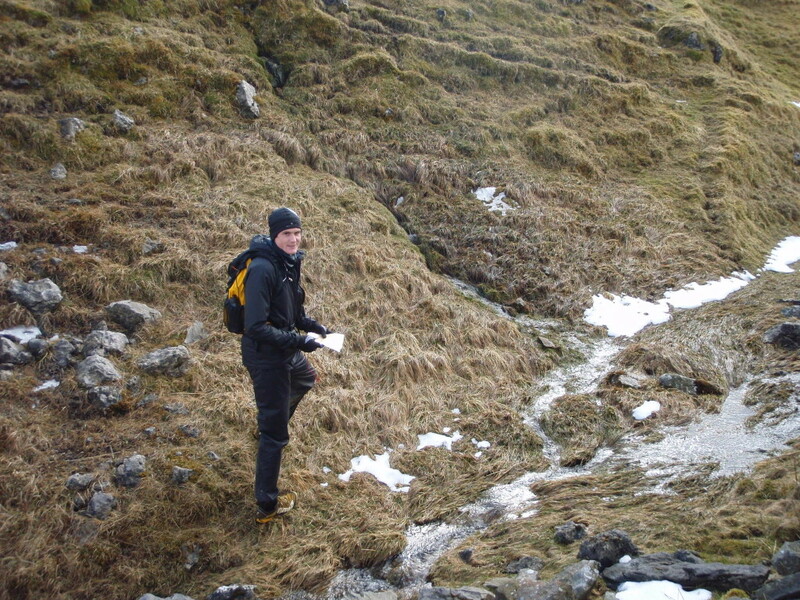 Just as I am thinking that the conditions over this area are better than expected the path disappears. I have a choice: the sunken path to my left which has collected at least 5 feet of snow or the open moorland ahead of me which seems to vary from shin to thigh deep. The lesser evil is the moorland route and I wade across it. Exposed tufts of heather stick out but these islands are a false hope offering little to assist my progress. 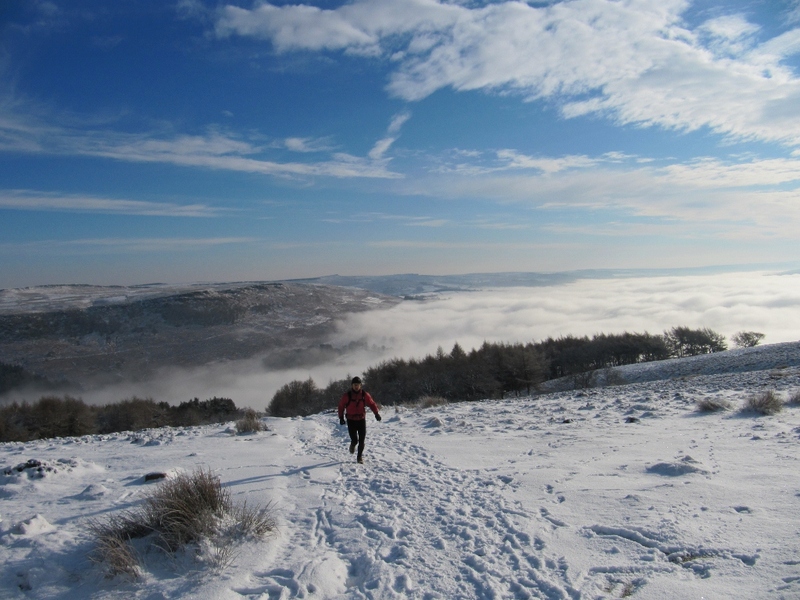 The moor is exposed here and the wind picks up spindrift and sends it swirling in small vortices into the distance – beauty and malevolence combined. 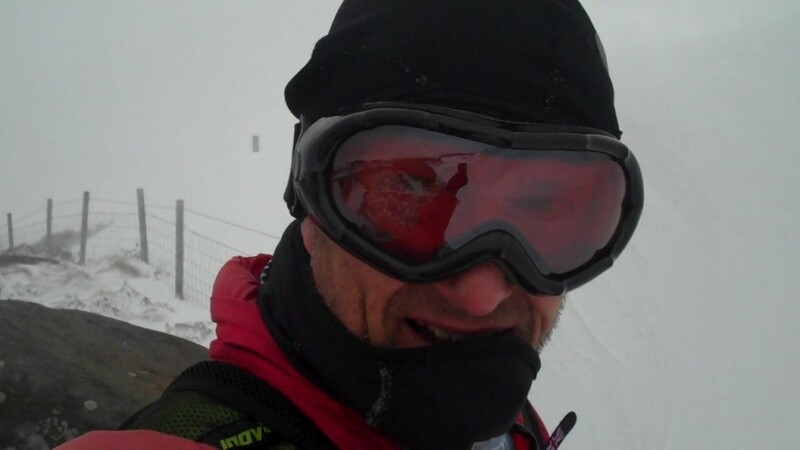 I am glad of the ski goggles that I am wearing but as I tug at my face mask and try to cover my nose it slips down immediately. 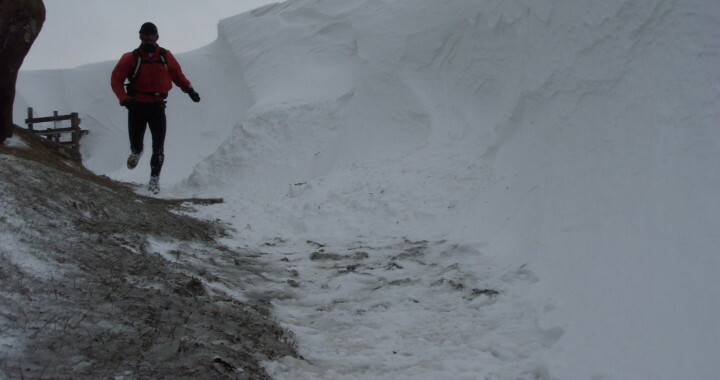 I hold it up momentarily but realise that I need both hands to assist forward motion and prevent face planting in the deeper drifts. Eventually I reach the path leading to the road crossing. Here a huge drift has formed forcing me to detour to gain the road but within a couple of minutes I am safely back at the car park. Five miles, not the Skyline’s 20, but a different type of hard. 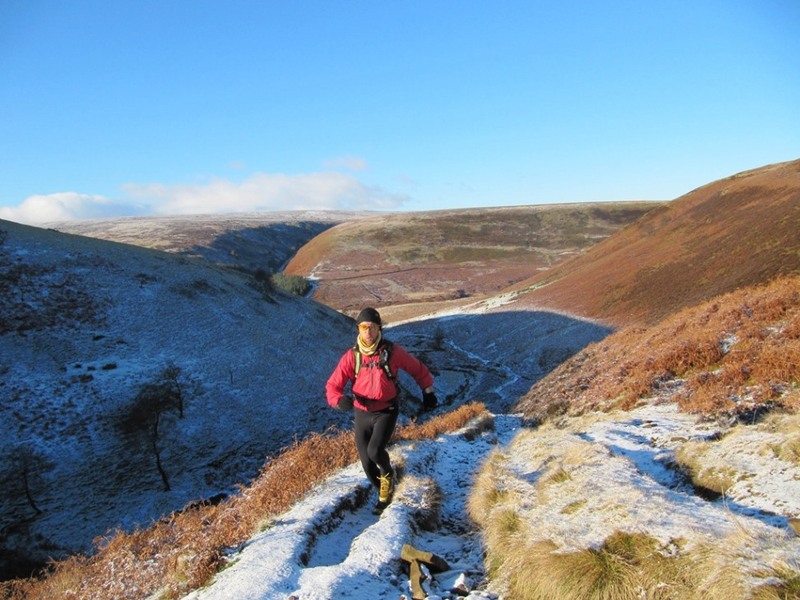 The Fell Runners Association holds two navigation courses every year. 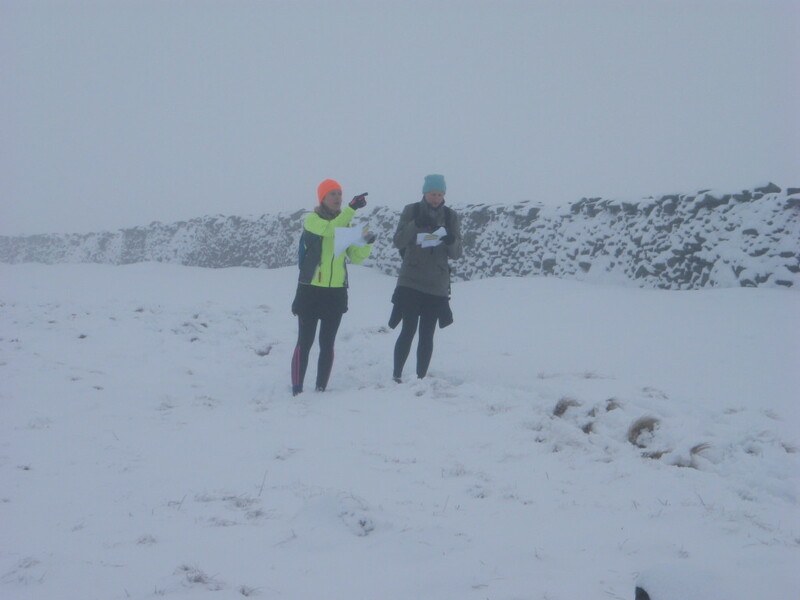 The Spring course from Kettlewell YHA in the Yorkshire Dales is sometimes held in warm sunshine… but not this year – winter returned! conditions on the “Spring” navigation course! Starting with introductions on Friday night then into a basic theory session discussing all things mappy, terms such as contours, handrails, attack points, aiming off and catching features were all added to the participants’ vocabularies. 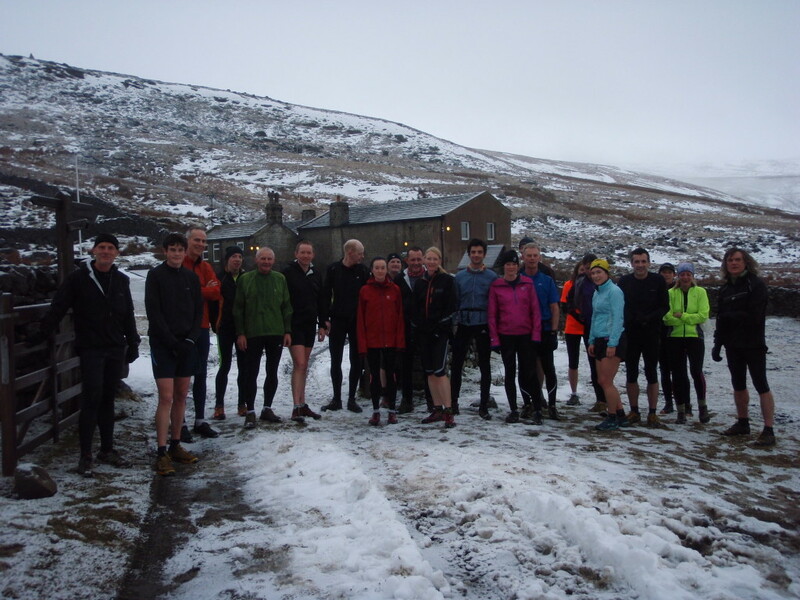 Then it was off to the local hostelry for further getting to know each other but with a reminder that people would be “encouraged” to take part in the morning 7 am run! 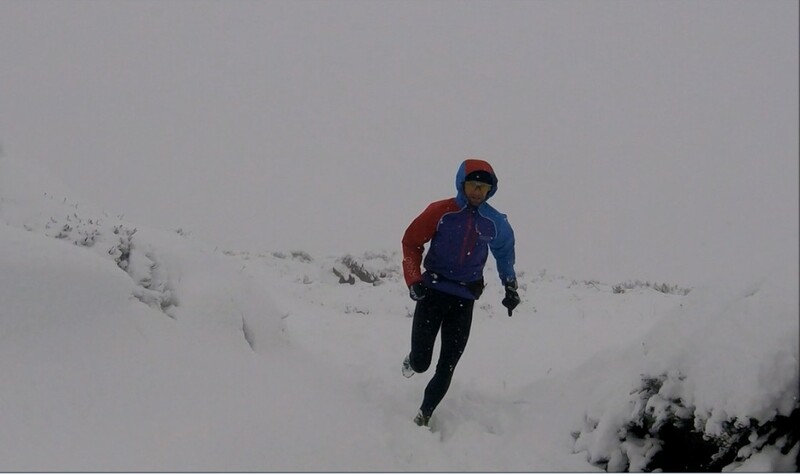 The early morning run gave a taste of the day’s conditions with light snow starting to fall on the trot up to Hag Dyke. Appetites whetted it was back down to the hostel for a hearty breakfast before the day’s practical activity. 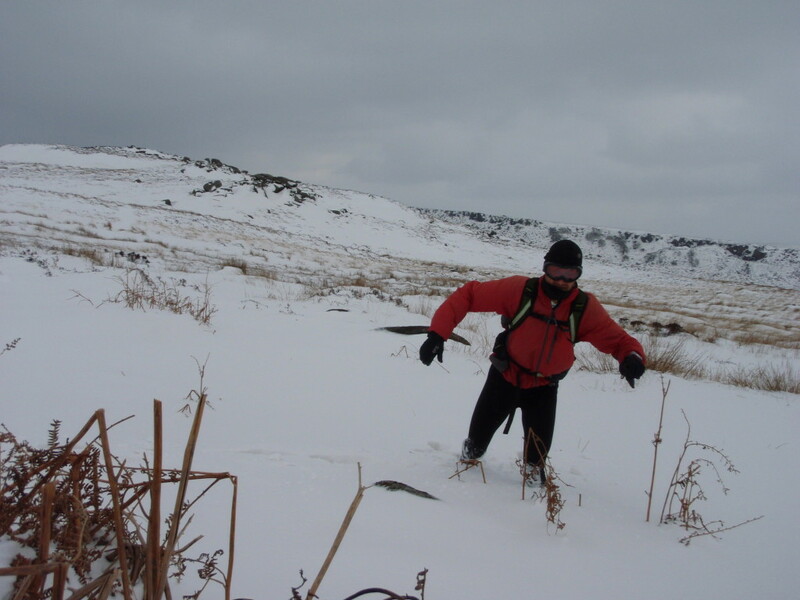 By mid afternoon it was time to let the students off the leash to take part in a solo, orienteering style activity putting into practice what they had learnt. The hillside was soon dotted with runners counting their paces and following compass bearings looking for shafts, gullies and re-entrants. After a long day on the hill the group were happy to get back for a shower and hot drink before tucking in to 3 courses of excellent food. Then it was time for the much anticipated night navigation exercise! 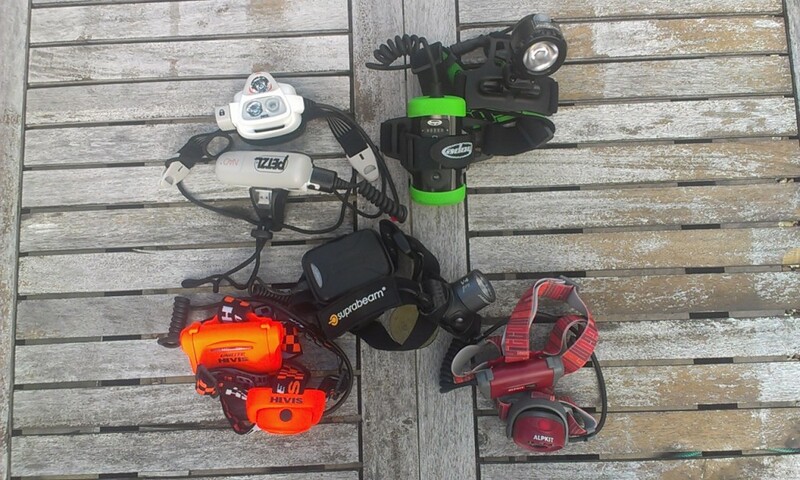 A few rather uneasy faces looked up as they were given details of their task; to use the skills they had learnt to locate checkpoints but this time in the dark. At least they were doing this in pairs so they had someone’s hand to hold! The instructors headed out to take up strategic locations making sure no one went astray and could soon see a trail of head torches coming up the hillside. This was a real test of navigation but there were plenty of major features to help re-locate if anyone went slightly wrong. the much anticipated night nav. 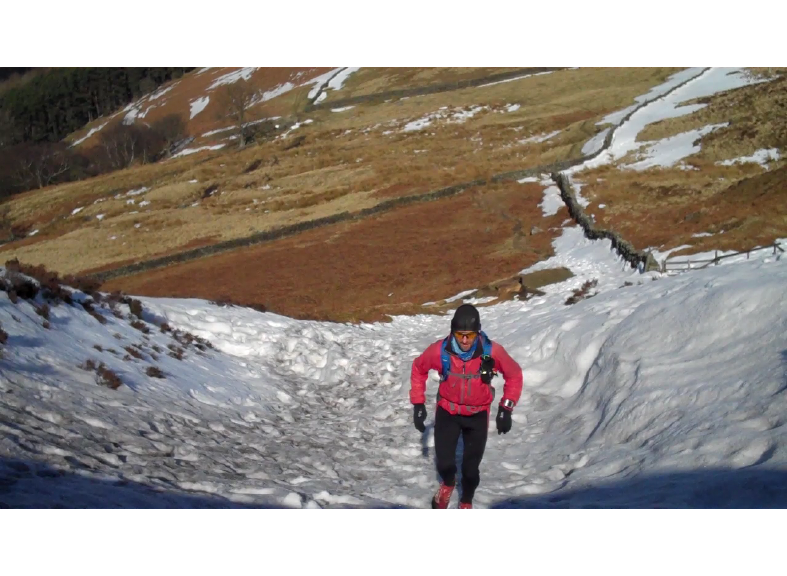 An hour later there was a real buzz in the pub as enthusiastic (or should that be relieved) runners exchanged stories of their experiences, the locals must have been wondering where all these gullies, boulders and contours were. Was it the exertions of the previous day or the “re-hydration strategy” that lead to slightly fewer runners assembling for Sunday’s 7am run? 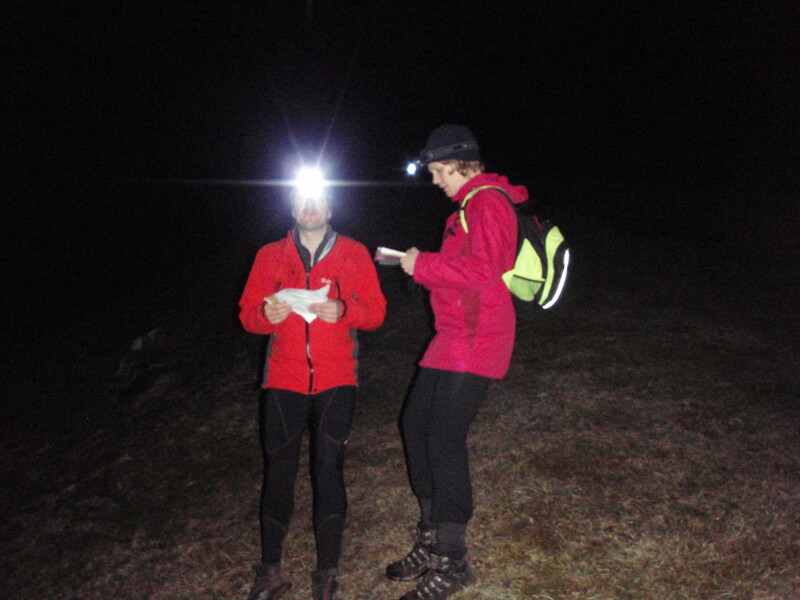 Those who got up had the chance to run around the night navigation course and see exactly where they went – or should have gone. Another good breakfast was had before the FRA’s Access & Environment officer Chris Knox gave the group an insight into the role of the FRA. 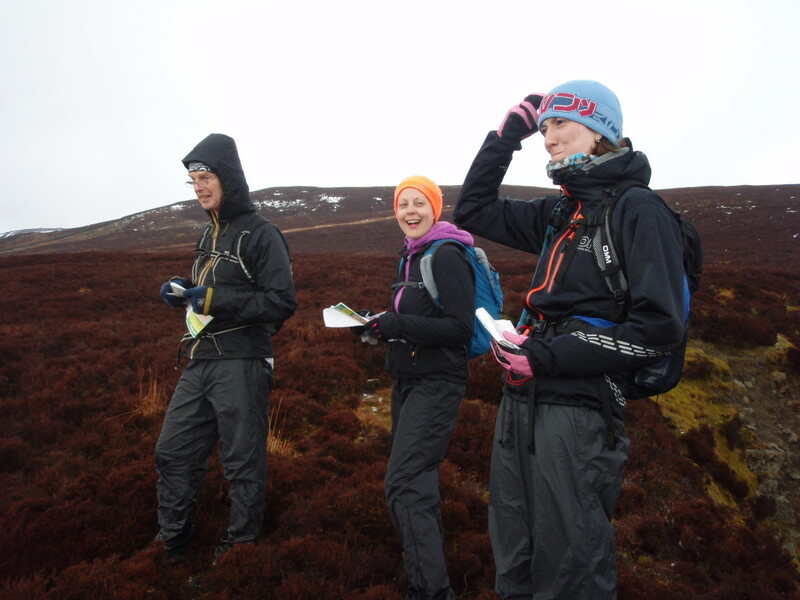 Then time to prepare for the final activity; the individual 10k navigation exercise. 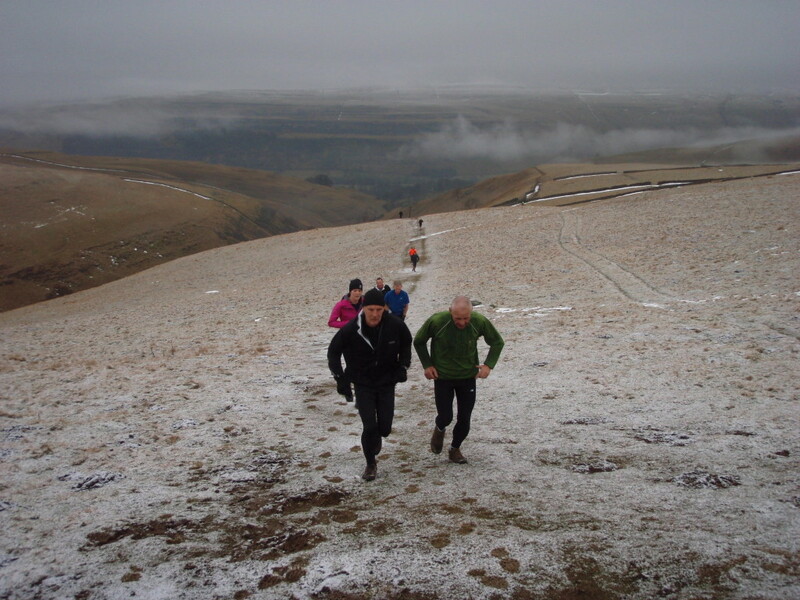 This took the form of a fell race with compulsory checkpoints but with the runners choosing their own route between them (although there was no pressure to race if people wanted to focus on the navigation rather than speed). 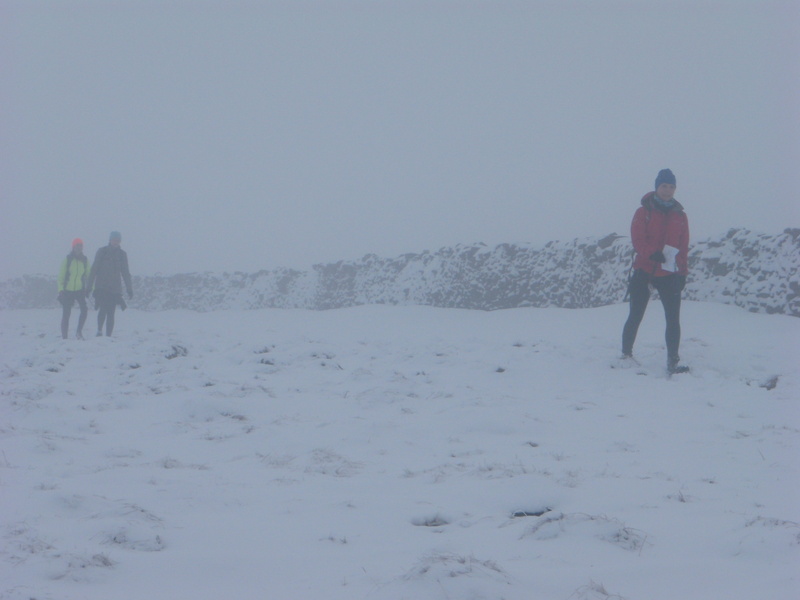 The one thing that hadn’t been anticipated was the weather as snow, strong winds and low cloud made for really testing conditions. The skills learnt allowed all participants to successfully complete the exercise and runners returned to base with a sense of achievement at what they had done. Feedback from the group showed they had all gained confidence and achieved something they didn’t feel at all confident with when they arrived. 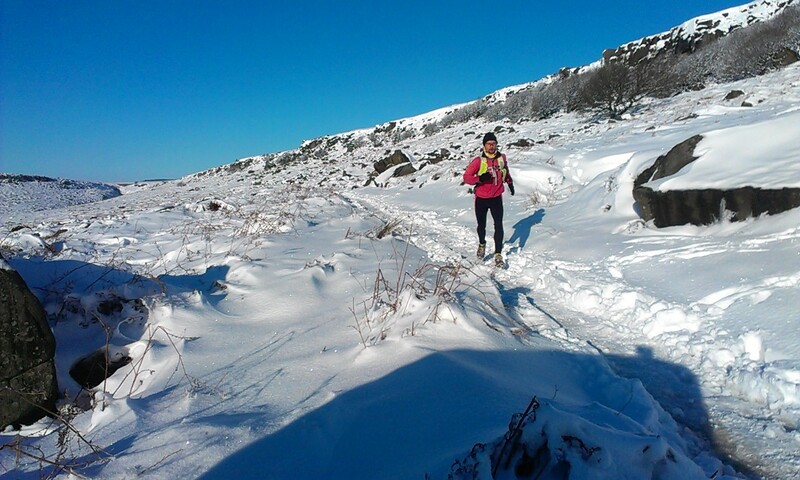 So a successful course and a happy gang of runners with a new set of skills ready to use in their next race. Thanks must go to the staff at Kettlewell YHA, the instructors who give their time for free, Steve Batley for organising the course (again), Margaret and Jenny for their hard work behind the scenes to ensure the administration runs smoothly and finally the enthusiastic participants who make working on the event so rewarding. 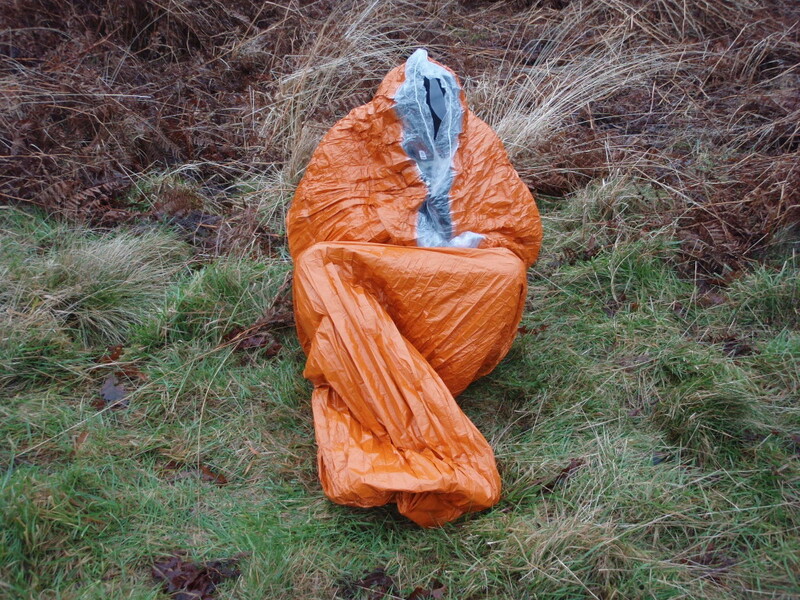 The Autumn course is at Elterwater, September 27 – 29. See you there.